The following tutorial will show you how to create a Fedora 9, 10, 11 + USB flash drive using Windows. Fedora is a Linux distribution that is sponsored by Red Hat and is both driven and maintained by the community. It is comprised of only free and open source software and will always remain free to use, modify and redistribute. 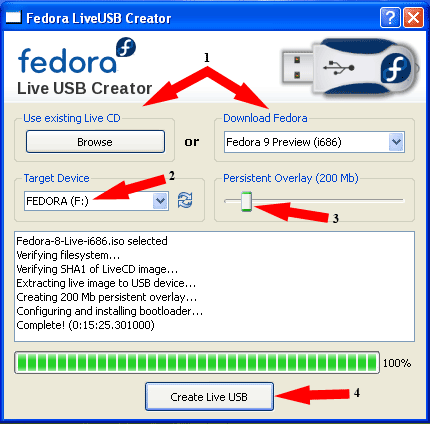 Recently, Luke Macken and Kushal Das, both active in the Fedora community have put together an intuitive and super easy to use liveusb-creator which can be used to make a Fedora Live USB flash drive. In addition, USB Fedora utilizes a Persistent feature, enabling a user to save and restore changes on subsequent boots. In the following, we will show you how it works. If all goes well, you should now be booting into your own portable Live USB Fedora.